Wearing the 1601 from 1966 today. 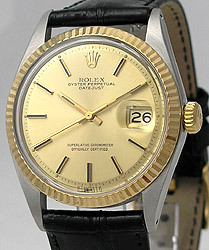 This is the only Rolex in my collection, for the simple reason that is one of the few non-in-your-face Rolexes around. I understand that the in-your-face factor is usually high on the list of “reasons to own” for many Rolex wearers (yes, generalizing and what-not…Cad, remember?) But I prefer my vintage watches to be elegant and low key. I say vintage because I’m unable to lift, let alone wear, most of today’s watches. On the leather band, I switched out the jubilee bracelet years ago, it looks like any other nice watch. Most don’t know it’s a Rolex unless they happen to get an up-close look at it. Which is the way I like it. Simple, understated, classic. This entry was posted in Accoutrements, Sartorial and tagged 1601, 1966, Datejust, Rolex, Vintage Watches, Watches by Sir Edward Percival Fox-Ingleby, Bt. Bookmark the permalink.